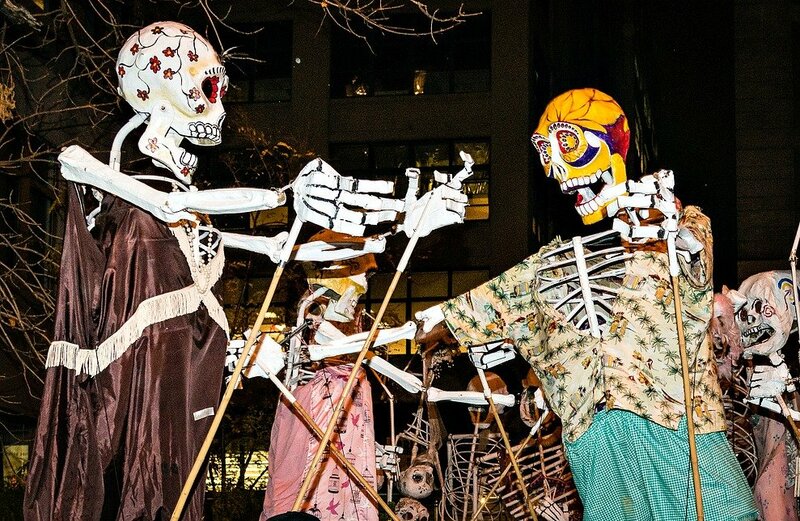 The Village Halloween Parade may not be as completely outrageous as it once was, but this annual holiday extravaganza is quintessential Greenwich Village. Though many parade attendees are there to show off their costumes and check out those of others, there’s a large number of guests who revel in the nostalgia of a New York tradition that’s marched downtown since 1973. But there’s a lot more history to the parade than most people may know. For instance, it didn’t always go up 6th Avenue, and there’s an entire art form behind those supersized puppets. The parade did begin in the Village, just a bit farther west than its current location at the Westbeth Artists Housing. Once home to Bell Telephone Laboratories, Westbeth opened its doors in 1970 as a very early example of affordable live-work spaces for artists of all disciplines. 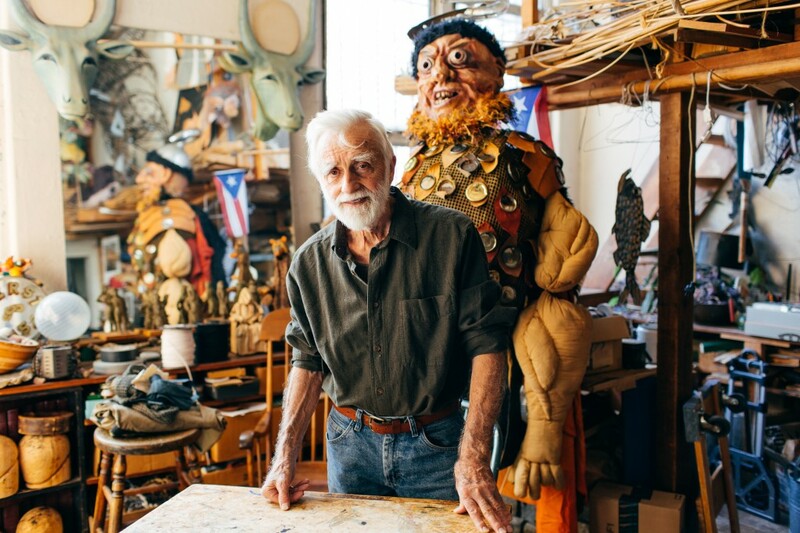 One of the building’s residents, Ralph Lee, started the parade as a “wandering neighborhood puppet show” for his children and their friends in 1974 in the courtyard of Westbeth. Lee is the founder and director of the Mettawee River Theatre Company and an award-winning puppet and mask maker. He had amassed over 100 masks and puppets, which he put to use during this inaugural event. The parade moved from the courtyard along West Street, ending at Washington Square. In addition to Lee’s giant puppets, the mile-long event included masked performers and musicians. Since it was such a success, the parade took place again the following year, this year with a culminating Vaudeville act in the park and 1,500 participants. Lee won a Village Voice OBIE Award for the 1975 parade “to recognize its artistic achievement and to encourage it to become an annual tradition.” Under his direction, the parade garnered support from the New York City Department of Cultural Affairs, American Express, and the National Endowment for the Arts, among others. A 1976 New York Times article said: “For some reason, the weekend’s biggest Halloween events will take place in or near Greenwich Village, which is not to imply that Village residents are spooky or weird or anything.” That same year, the parade became an official nonprofit organization and organized a core production staff. Also, George Bartenieff and Crystal Field of Theater for the New City produced the event on a larger scale as part of their City in the Streets program. Artists visited local schools and made giant puppets with children. Musical groups of all genres, including samba, Dixieland, African, and steel bands, were enlisted and played throughout the parade. Anyone was invited to walk along the route and those bystanders who felt compelled could jump in at any time. Another change came in 1977, when the route was changed to 10th Street, stretching from Greenwich Avenue to Fifth Avenue, but still ending in Washington Square. It was the first year that a giant spider hung from Jefferson Market Library’s clock tower, a creepy detail that still exists today. The Washington Square Arch also took part in the festivities. A fat devil sat on top and released balloons, and a fake version of the devil slid down a wire and landed in the fountain below. Puppeteers Alex Kahn and Sophia Michahelles, who worked with Ralph Lee in the early days, are the co-directors of Superior Concept Monsters, which makes giant paper mache puppetry commissions, most notably for the Village Halloween Parade. Most of their giant puppets are lit from within, since the parade takes place at night, and are operated by a team of puppeteers. Through September and October they’re aided by hundreds of volunteers at their upstate site who help construct all the puppets for the parade. Every year a distinct parade theme is chosen. Master puppeteer Alex Kahn suggests a theme, which is then approved by Fleming. Not only does the theme influence costume choices, but is the inspiration for the performance that leads the procession. Many themes have been in direct response to national events. In 2001, following the 9/11 terrorist attacks, they chose the theme “Phoenix Rising,” with the hope of lifting the spirit of New Yorkers. 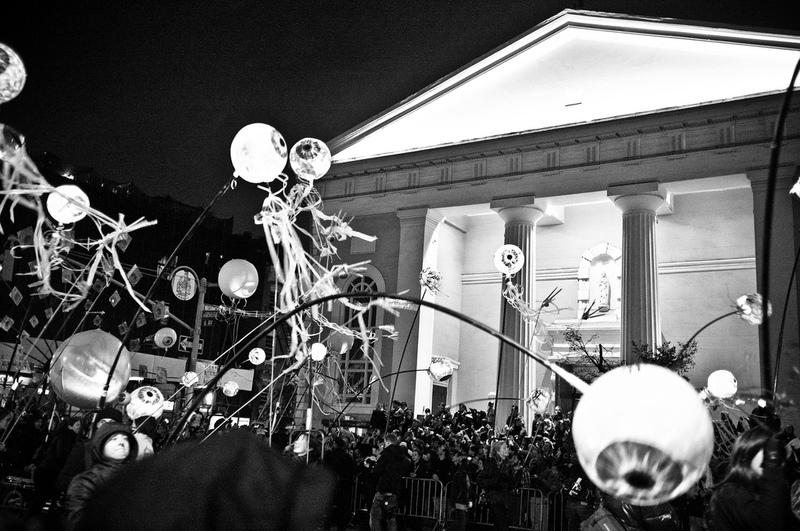 Similarly in 2005, after Hurricane Katrina, the theme was “New Orleans Mourned…and Reborn!” Fleming invited all displaced New Orleans residents to gather at the parade, which included a series of giant lanterns depicting New Orleans landmarks. Due to Hurricane Sandy, 2012 was the first time the parade was ever cancelled, and it caused the parade to suffer major financial losses. It was uncertain if a 2013 parade would be possible, but thanks to a successful Kickstarter campaign it was brought to life with the theme “Revival! Hallelujah Halloween! 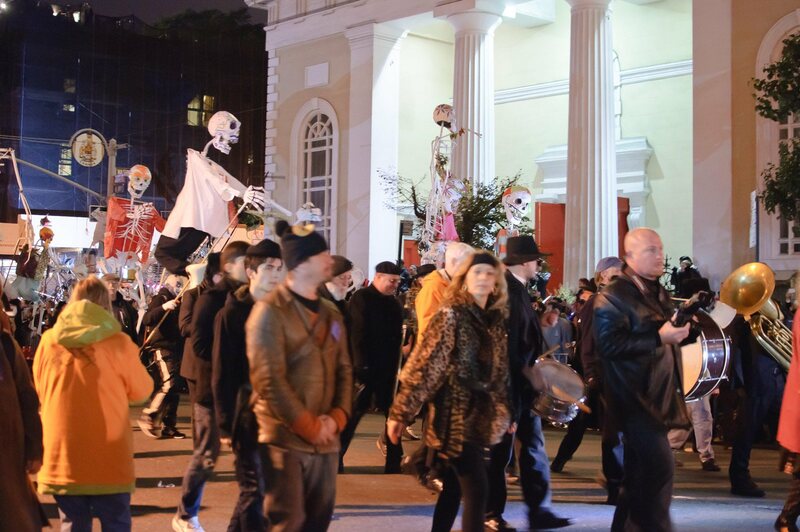 Bring Halloween Back to NYC!” 2015’s theme was “the Garden of Earthly Delights,” and corresponding puppets included unfurling blossoms and tempting fruits, as well as a giant Tree of Life. This year, we can’t what’s in store on the 31st when “I AM Robot” makes its way across the Village streets with its Grand Marshall, “extreme costumer” Machine Dazzle. Today, the parade is the largest of its kind in the world and attracts over two million spectators and 60,000 participants. Get all the info on tomorrow’s parade right here. The original parade was really organized for children. My son participated in that one and several others that followed. The parade is now a nuisance and a detriment to the neighborhood. It is a drunken affair that spews garbage and creates noise that continues through out the night. It blocks residents from walking on their own streets and having quiet enjoyment of their neighborhood. It should be moved to a non-residential area as are all other parades in NYC. It is no longer a community affair. After participating in the parade out of Westbeth more than a few times, I went back about 10 years ago in the hopes of rekindling some lost memories. I was shocked at the sad state of affairs it has become. Motorcycle caravans and trailers playing bad music… sigh.